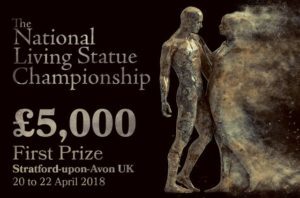 Stratford-upon-Avon will play host to the UK’s first National Living Statue Championship on 20-22 April as Shakespeare’s Celebrations and LSD Promotions have teamed up for this exciting element of the new look 2018 Birthday Celebrations. A brand-new highlight of the extended three-day extravaganza, the Championship provides a fantastic opportunity for professional and junior Living Statues to pitch against the competition to win a cash prize. Applications to take part in the competition have now closed as artists have flocked from across the world to join the inaugural competition. The competition runs on Saturday 21 April and Sunday 22 April in Bancroft Gardens and has two categories – professional (first prize £5000) and junior (first prize £50). Professionals will need to complete at least five 45-minute performances over the weekend, with juniors carrying out four 30-minute performances during the Championship. Cllr Victoria Alcock, Mayor of Stratford-upon-Avon said: ‘Every year Stratford-upon-Avon buzzes with excitement as the Shakespeare Birthday Celebrations take place and this year having the new Championship ensures there is non-stop entertainment available. Our biggest annual event is set to become even bigger!’. The winner will be announced from the bandstand on the recreation ground at 4.15pm on Sunday 22nd April. There will be a panel of judges who will visit each artist across Saturday and Sunday and mark them between 1-5 on various aspects including their character, costume and make-up. To view Madam Matronic’s five top tips on becoming a living statue please click here.